Exposed: Investigation materials of officer now beginning trial for allegedly killing an Arab rioter in 2014 Nakba Day prison assault. Investigation materials from the case of Ben Deri, a Border Police officer accused of manslaughter in the death of a Palestinian rioter during Nakba Day riots exactly two years ago on May 15, 2014, were revealed on Sunday and expose what the officer has undergone. The materials were published by Walla in time for Nakba Day; Nakba, meaning "catastrophe" in Arabic, is a term used by the Palestinians to lament how the Arab armies failed to destroy the nascent state of Israel in 1948 and slaughter its civilians. May 15 is an annual day of protests against Israel's very existence. An indictment was submitted against Deri in November 2014 accusing him of killing Nadim Nuwara (17), and the hearings on his case are to continue next week. Mohammed Abu Taher (22) was also killed in the same riots, but recently it was decided to close the investigation into his death as the evidence clearly showed no wrongdoing. An autopsy on the two was held in Ramallah, after which military police conducted an investigation with the case later passed to Judea and Samaria district police. 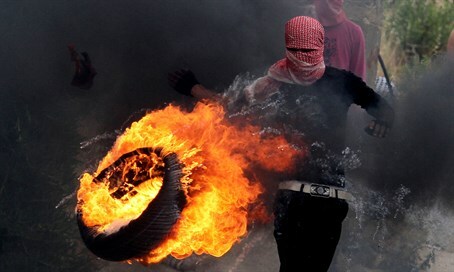 In the incident back on May 15, 2014, Nuwara died in Bitunia to Jerusalem's north while taking part in a violent attack with at least 150 other Arab rioters besieging Ofer Prison and hurling rocks, firebombs and burning tires, in an apparent bid to break terrorists out of jail. Officers used rubber bullets and tear gas to keep them at bay. Deri's trial remains in the stage of presenting evidence, with the trial extending so long due to the complicated investigation. He was arrested in November 2014, half-a-year after the incident. Six months ago the first trials began in his case, but it turned out that the judge at the Jerusalem district court was an uncle of his, and therefore the judge had to remove himself from the case and turn it over to another judge. The trial began with the new judge in April. "They think they caught some Nazi"
The materials from the investigation revealed by Walla! News show that Deri, who was 20 at the time of the incident, was angry at being tried for his activities to defend the state. Police likewise recorded his phone calls with his comrades to try and divulge a backhanded admission from him. In investigation, he said, "an injustice has been done to me, this has gone out of proportions." "I know I didn't shoot with live ammunition, I don't believe that I'm here. I'm like any soldier who contributes to the state, I've been through life-threatening danger in my military service from Palestinians." A phone conversation from November 2014 between Deri and another Border Police officer who was investigated with him was revealed along with the rest of the materials. Deri's comrade said of the investigator: "He thinks that he is investigating war criminals, that he caught some Nazi. ...We didn't take bribes, we didn't do...all (we did) was an operational mission, and you ask yourself, is this what I deserve? What a country, what a world." In response, Deri said, "I'm not hurting for myself, I'm hurting for my parents who have to go through this again," in reference to his brother who was arrested in the past. He added, "I don't believe that I'm here." In another conversation secretly recorded by police later the same day, after the investigators began investigating another combat soldier who was at the incident, Deri's commander spoke with him. "We're in the same s*** in the end. You look back, you say, how much you gave of yourself, and you initiated and you went out...(all for) nothing, you see treatment like...," said the commander, at which point Deri interjected, "it's not worth a damn thing." The investigation materials also included CNN footage recorded during the riot, as well as security camera footage, and an autopsy report indicating Nuwara was killed by Deri's weapon. However, the state expert in the ballistics investigation of the incident found two possible angles for the lethal gunfire - one from where Deri and his comrades were stationed, and one from another location further away. Regarding the security camera footage, an investigation of them raises great question marks as to what actually occurred. The CCTV footage of the riot was released by blogger Elder of Ziyon showing the two Arabs who died in the riots falling - but not a drop of blood was left behind, despite the claims that they were shot by bullets that went through their bodies. In both cases the collapsed rioters were removed, and left behind perfectly clean pavement. "We were in life-threatening danger"
In investigation back in November 2014, Deri argued his innocence. "I don't understand why I'm here at all," he said. "I carried out my role as well as possible, I acted according to the regulations and I worked under an officer." He noted that at the location he was stationed at there were two other Border Police officers, as well as a soldier from the IDF Spokesperson Unit who documented the event and asked to try shooting one of the rubber bullets being fired at the rioters. "He fired just one tampon (rubber bullet - ed. ), not at the protesters but rather at the wall in front of the 'porch,'" he said, referring to where they were stationed. Deri denied that he fired live bullets at the protesters, even when presented with the autopsy reports that claimed he fired live ammunition. "As far as I'm concerned it didn't come from my weapon. I didn't fire live (ammo). Within me I'm certain I didn't fire live." In his investigation in May 2014, he confirmed that he fired several rubber bullets during the riots, but argued that he checked each time that he had loaded rubber bullets and not live ammunition. Deri also described the imminent danger presented by the hundreds of rioters, saying, "as far as we were concerned a firebomb is life-threatening danger, and that day firebombs were thrown at the force I was part of on the 'porch.'" "Some of the firebombs reached the 'porch' and caught fire mere meters from the force." The investigators also recorded a conversation between Deri and his concerned parents on November 11, 2014, and a transcription of the talk was revealed by Channel 10. "I can't take these investigations anymore," an emotionally worn Deri can be heard saying, to which his father replied, "hold on." "I can't. It's being made complicated. And that's it, it looks as if I'm guilty," he said. "Leave it, it's okay, it will pass," his father said, trying to encourage him. "A day or two and it will pass for you. Hold on." The young officer reiterated that he was reaching the end of his strength due to the intense interrogations, and his mother advised him to exercise his right to stay silent, at which he said, "they're showing me here videos, and it all looks as if it was me, as if I shot." "Okay, so they're showing. They show you what they want to see," said his father, and his mother added, "they want to accuse you by force." When asked by his father if he's eaten, Deri replied that he has no appetite, at which his mother told him to eat and drink so as not to collapse. "What?," replied an emotionally tense Deri, who could then be heard crying on the line. "What will I do, what? What, I'll sit in jail now? They say that I'm suspected of murder." "Ignore them, tell them that they're murderers and not you. Because you are defending the state, and this is the 'thank you very much' that you're getting," his mother said. Through his lawyer Tzion Amir, Deri asked to receive the military investigation conducted by the Binyamin Brigade Commander mere hours after the incident. The request reached the Supreme Court where it was rejected by Judge Yitzhak Amit, who said that the eight-page report "includes relevant details to the incident, but they are well known to the appellant, and they appear in the investigation material." Judge Amit added that "it is known that the conclusions of the investigation are that live ammunition was not used," noting how it supports Deri's case. In his decision, given in December 2014, Amit noted that another investigation by the company commander also exists, but said the two were conducted before the autopsy that claimed the bullet that killed the rioter was shot from Deri's gun. Deri's lawyer Amir said, "an investigation of the evidence materials does not remove the doubts and the serious question marks in the case." "Precisely the failures of the investigation - actions that the authorities were expected to conduct and they did not - knock the legs out from under the indictment," he added, slamming the convoluted autopsy process.